Only a handful of activists on the fringe left have advocated abolishing U.S. Immigration and Customs Enforcement, but they’re the ones who get attention. Republicans are making sure of that. If I worked for President Donald Trump and designed a T-shirt that read, “I don’t believe in borders” in Spanish — and I got a Democratic congressman, say Minnesota’s Keith Ellison, to parade in it — I’d probably get a raise. Heck, he might even give me a top agency job with his unspoken permission to abuse the taxpayers. But Trump didn’t need to pay anyone to pull off the T-shirt feat. Ellison did it for him and for free. Trump really doesn’t have strong issues other than immigration. The tax cuts have produced little joy among working people. After inflation, average wages in the sector covering construction, manufacturing, health care and fast food actually slipped in May. The recent report of 4.5 percent real economic growth in the second quarter drew a “Wow!” tweet from the president. And it was impressive — almost as impressive as the 4.6 percent growth seen in two of Barack Obama’s quarters, though nowhere near Obama’s 5.2 percent in the third quarter of 2014. No, all Trump’s got now is immigration. His problem here is that poll after poll shows a general public that’s quite moderate on the issue. Most Republicans say they want a path to citizenship for otherwise law-abiding undocumented immigrants. Most Democrats want enforcement of the immigration laws. And Trump’s cruel policy of separating children from their parents at the border nauseated people across the political spectrum. On the surface, that highly unpopular ploy would seem to work against his agenda. But suppose there was calculation in that move. 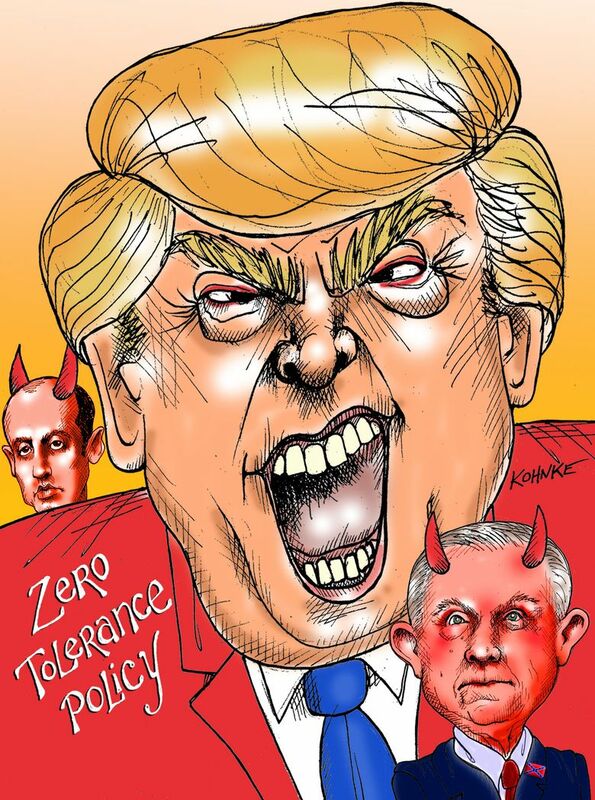 It’s quite possible that the Trump camp created the painful scenes to bait some Democrats into taking radical positions against all immigration enforcement. If so, he succeeded, witness Ellison’s outrageous call for no borders at all. Actually, only a handful of activists on the fringe left have advocated abolishing U.S. Immigration and Customs Enforcement, but they’re the ones who get attention. Republicans are making sure of that. But so are the news media. The New York Times, for one, made a big deal about a surge in social media traffic in support of the ridiculous idea. Social media “opinion” is the creation of a few people with time on their hands. And did anyone on the news desk inquire as to the possible presence of Russian bots trying to get Democrats to fight one another? ICE enforces the immigration laws. It doesn’t make policy. Demands to disband ICE for inhuman practices are like right-wing efforts to rip up the Internal Revenue Service because some people object to paying their taxes. The IRS doesn’t write tax law. It enforces it. Getting rid of the IRS would lead to massive tax evasion. Here’s the problem with the Democratic leadership. Senate Minority Leader Chuck Schumer did shoot down calls to “abolish ICE.” House Minority Leader Nancy Pelosi has gone all wishy-washy on this critical issue. When you hack through her complex explanations, you find a proposal to reform the agency, not simply disband it. If that’s the case, use the word “reform” and not “abolish.” The latter is an emotional outburst from a far-left fringe that does more to sabotage Democrats than get them elected. A regulated immigration program protects blue-collar workers, be they white, black, brown, native-born or documented foreigner. As for the undocumented, they won’t get legal status until the public feels confident that the laws are being enforced going forward. Responsible Democrats must make loud and clear their belief in a humane but law-respecting immigration system. Not getting in front helps Trump (and Russian bots) trap them into seeming to tolerate positions anathema to the larger public, including the workers they profess to champion. This is nothing less than political malpractice. Froma Harrop is on Twitter @FromaHarrop. Her email address is fharrop@gmail.com.